Happy Mother’s Day to all the mommies in our lives! Between writing the cards and sending the flowers, make sure mama has something good to eat, too! 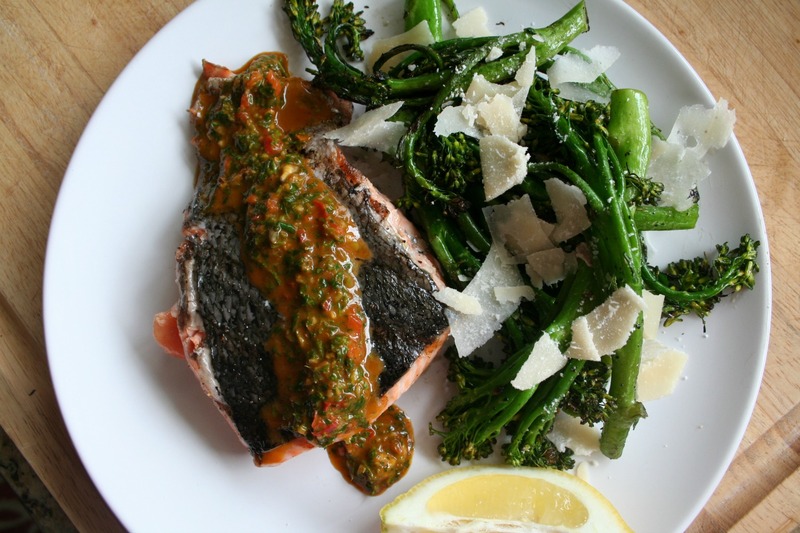 If you plan on cooking for your darling mama this weekend, here is a simple and light grilled salmon recipe with red chimichurri sauce. We were inspired by Olive Garden’s Lighter Italian Fare item, the Herb-Grilled Salmon. (And if you haven’t tried the new Lighter Italian Fare dishes, like the Chicken Abruzzi or Garlic Rosemary Chicken, you are missing out! Both tasty entrees are under 575 calories! )Olive Garden takes a fresh salmon fillet and brushes it with olive oil and Italian herbs for a fragrant and flavorsome meal. The red chimichurri sauce in this recipe below adds layers of flavor to your fish, with vibrant fresh green herbs of cilantro, parsley and oregano and a slight bite of raw garlic. 1. In a food processor, combine the pepper, salt, chili flakes, paprika, oregano, lemon juice, cilantro, parsley, bell pepper, green onions, garlic, and vinegar. Blend on low while simultaneously drizzling in the oil, until it forms a wet sauce-like paste. 2. Preheat your grill. Prepare your salmon for grilling by sprinkling lightly with salt and pepper. Rub it gently with olive oil. 3. With your grill smoking hot, place the salmon fillets on the grill skin side down first. Allow the skin to tighten and become a little crispy before flipping, about 3-4 minutes. Continue to cook for about 2 minutes, or until you reach the desired doneness. 4. To serve, drizzle the red chimchurri on the salmon and enjoy. Olive Garden is currently offering their “Signature Favorites” for just $10, which will run through Mother’s Day, so you can get quality and value; your mama would be so proud. And if your mama is in another state like my mama, you can always surprise her with a gift card to an Olive Garden of her choice. For every $50 in Olive Gardens gift cards, you can receive a $10 bonus card that is valid June 30th through August 10th. *This is a sponsored post, but all of the opinions are our own.